Dead. Dead. Oh, dead again. Having been released on PC and Mac in October last year GoNNER now sees its console debut on Nintendo Switch, brought to us by publisher Raw Fury Games and developer Art in Heart. Generally loved by players and critics alike in its original guise GoNNER is a roguelike platformer, consisting of ever-changing, procedurally-generated levels, tight platforming and combat that will make you die again and again as you learn the best way to play. “Ha! It won’t defeat me!”, we hear you cry – oh, how wrong you are. GoNNER is hard. Seriously hard. The game sees you play as Ikk, a blob-like being with detachable head and accessories, whose goal appears to be showing love and caring for a giant, land-bound whale called Sally. Awesome! To do this, Ikk must travel through several worlds – each with their own theme – defeating monsters, jumping over pitfalls and, most importantly, trying to not die. Dying will send you right back to the start and as previously mentioned, each room Ikk travels through is procedurally-generated, meaning that every time you play the rooms will have a completely different layout. Thanks to this you never know exactly what to expect in terms of where and how many monsters will be waiting for you in the next room, and whether or not it was a good idea to use up all that ammo you just wasted trying to kill a snail. (Trust us, it’ll happen). Before you jump into this world of doom, you have a quiet moment of down-time with your friend, Death, where you can choose which head, weapon and backpack you wish to equip. As you play through the main game you’ll start to unlock new types of these things, which will then become available for you to select before attempting the game again. Each hat, weapon and backpack have completely different attributes – for example, the Brick Head gives Ikk three health, and allows him to keep hold of his weapon and backpack should he be hit by a monster. The Flame Head, however, gives Ikk two health but makes him immune to explosions. With several different heads, weapons and backpacks (which consist of special abilities such as reloading or rapid-fire attacks) available, there are a number of different play-styles to choose from. Experimenting with different combinations is key, as you’ll soon learn which areas you like and don’t like about each type of ability. These abilities are never explicitly explained to you either, so you’ll have no idea what a new head is going to do for you unless you try it on and work out what’s different. This is actually a consistent theme throughout the game. At no point whatsoever does it ever tell you what to do, what anything is, or how to cope with that giant bat that just came hurtling towards your scarily-unstable noggin. At first, this leaves you utterly clueless as to what is going on, but with patience and an optimistic approach to learning by error, you’ll soon start to figure things out. In what is possibly the world’s worst segue ever, another consistent thing about this game is the quality of its aesthetics. The worlds are brought alive by great art and sound in a way that screenshots can’t really show. The floors and ceilings of each room only appear to you as you get closer to them and their colour changes depending on the colour of either yourself, or your enemies. This means that as you play, the world seems to move with you. Likewise, the sound effects create a very satisfying experience with each button press as you fire your weapon or even just sift through menus. The game is relatively short in length from the opening room to the final boss, but this doesn’t mean you’ll complete it quickly. Getting from start to finish is an incredibly difficult task that will require an awful lot of patience, learning and re-tries. Most of your game time will be spent getting used to controls, trying to remember how each different enemy-type moves and perfecting your combat to acquire more glyphs (an in-game currency of sorts that can be used to “continue” should you die or buy new weapons) on each play-through. There are also some hidden rooms to find, other secrets that we won’t spoil for you here and even a daily challenge where each day you are presented with a different, brand new set of procedurally-generated rooms to tackle aside from your main story. If a list were to be created of games available on Switch that make you say “oh, just one more go” for approximately four hours, this would sit right on top. An addictive, beautifully presented experience that will bring you hours of joy/frustration, GoNNER seems a perfect match for the Nintendo Switch console – offering a gameplay style suited to both quick bursts of play and longer, dedicated sessions. Possibly too tricky for some players, this game requires a lot of determination, offering little respite - expect to be thrown back to the start countless times as you try to progress. If you’re the type who enjoys a serious challenge we recommend giving this title a go; it is one that will reward those who stick with it the most. Love these types of game so I will pick this up soon. I've been playing GoNNER since just after 1pm and I haven't put it down since... well, until now. Addictive isn't the word. This game is like crack to me! I can see this turning into another Nuclear Throne for me – a game that I've ploughed very nearly 300 hours into on my Vita. I love a challenge, but with so many games on my to-do list I can't afford the time to play a game of this difficulty caliber. I end up giving up too quickly. I might pick this up this afternoon during my break and give it a shot. @GrailUK I very much doubt you'll regret picking this baby up. It's all kinds of awesome! Usually not the type of gamer who looks for a challenge but randomly-generated rooms are just what might keep me playing. Plus, it's just 10 bucks. This is the quintessential "one more time" game. Sure you could be careful and try to survive and make it to the boss. To me though the greatest fun is getting and keeping the uber cool multi-color techno combo system. This game is great for a short few playthroughs and the long grind. I picked this up on Steam shortly after release and can't recommend it enough. If you think you might like this game, chances are you will. I'll be buying it again on the Switch as it's perfect for short, pick and play sessions. The difficulty is a wonderful boon for me. This is the kind of game I want to come back to on a weekly basis, even long after completing my first run. Being tough is essential in distilling that gaming investment into a short, satisfying white-knuckle rave of brutality and fatality. Is there no HD Rumble support? @Mishima get over it, it's business not personal. Nintendo cares not about you or I. As a gamer if you like the look of a game you buy it. GoNNER is a great game but I personally wouldn't pay £8.99 for it. Whilst a lovely game and designed perfectly there isn't tons and tons to it and it's not likely to last most players more than 3 hours. If it ever goes down to around £4 I'd say it's an absolute instant buy. @thesilverbrick I get your situation, but this is a game you pick up, say, before a round of Mario Kart, or after a Zelda session, or whenever you have a little free time. You only really need 15-30 minutes to attempt a run, chances are not great you will last much longer. This isn't the kind of game you beat once and shelf for good and unless you must beat it in proximity to purchasing it. Instead I would recommend giving yourself time to breath and cherish the struggle rather than constantly banging your head against the wall. For me, I look forward to each doomed attempt. If it takes months, or even a year, to complete that first run, so be it. Each run adds value. To me the thrill comes from flying higher than you previously thought possible, and as your wings are singed, struggling to maintain flight. If you treat it as a game simply to plow through without returning, some of the appeal and most of the utility is lost. That may yield 5 or so hours of intense gameplay, but you'd be missing out on the value proposition of having this game on your Switch. @davidevoid Wouldn't pay £8.99 for it? Haha, I've heard everything now! 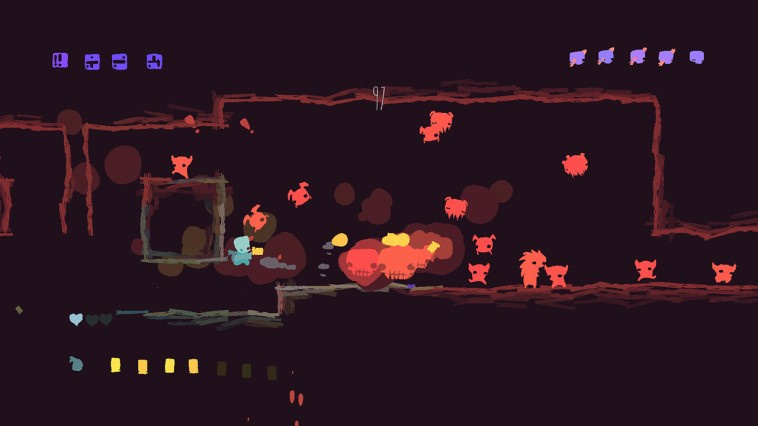 With its randomly generated levels, GoNNER is a game you can comfortably sink dozens upon dozens of hours into. From a longevity standpoint, GoNNER can easily live with the big first-party titles like Breath of the Wild and Mario Kart 8 Deluxe, but because it's an eShop indie, it's only worth four quid?!!!!! Just imagine the man hours that went into making a game like this. People who's livelihood it is to devote hundreds of hours into perfecting an incredible roguelike, but people who've admitted that it's a great game aren't prepared to drop more than a fancy cup of coffee's worth of change on it? It's like those who refuse to pay any more than a pound / dollar for the iOS version of The Binding of Isaac: Rebirth because it's on a phone. @xxAcesHighxx just out of curiosity do you own the game? I do, and I think it's great! But simply because it has randomly generated stages doesn't mean it is endlessly replayable. The gameplay falls into a very specific routine rather quickly and the only thing that ends up changing with each playthrough is how the player actually plays the game (do they take it slow and try and progress through a higher number of stages or go quickly in order to get a high score). Everyone's perception of worth or value:money is different though, I just know that although I love these kind of games I would rather put £9 towards something with more variety or length. Pricing is a tricky thing to balance, the potential being that if its too high no-one even bothers to give your game a try. I think a lower price would be far more enticing although I know new Switch owners are willing to gobble anything up at the moment! The game is usually £6.99 on Steam but is on sale a fair amount (you can get it there for £2.09 right now!). @thesilverbrick Although it's difficult its actually not that off putting and it's pretty easy to jump into and have fun with. I definitely know that feeling though! @xxAcesHighxx Same deal with Super Mario Run, really. Mobile customers have gotten so accustomed to dirt cheap or free games primarily fueled by micro-transaction driven freemium mechanics that they're rarely willing to give a high quality mobile game a chance when it's priced over a couple of dollars. It's why the freemium model will continue to dominate on smart devices, and why smart devices will never be a decent replacement for proper consoles. I can't deny I'm a part of the problem, though. PC gaming culture has a similar problem. I'm so used to buying indie games dirt cheap on PC through Steam or Humble Bundle that I balk at the idea of paying more than $5 for PC indies, even if they provide hours of content and are incredibly constructed. Only played a bit, but loving it so far! I adore the art style and music, and the gameplay is already coming together for me. I can also say that this is the sort of game I got used to seeing and thinking "This looks really interesting, creative, and quirky.... I assume it's Playstation-only. Rats...." Same goes for a title like Tumbleseed. Nintendo is finally getting creative, colorful, polished indie titles that normally would have only ever seen their audience on other platforms. That alone is worthy of celebration and support as far as I'm concerned. @MarioPhD All the music and sound effects were made using one synth, the OP-1 which is pretty cool. $10 on Switch seems a great price for this game! I kind of prefer roguelike games that are a little easier to get into, because by the sounds of this review, this game might be a little too challenging for my tastes. I don't prefer frustrating experiences. 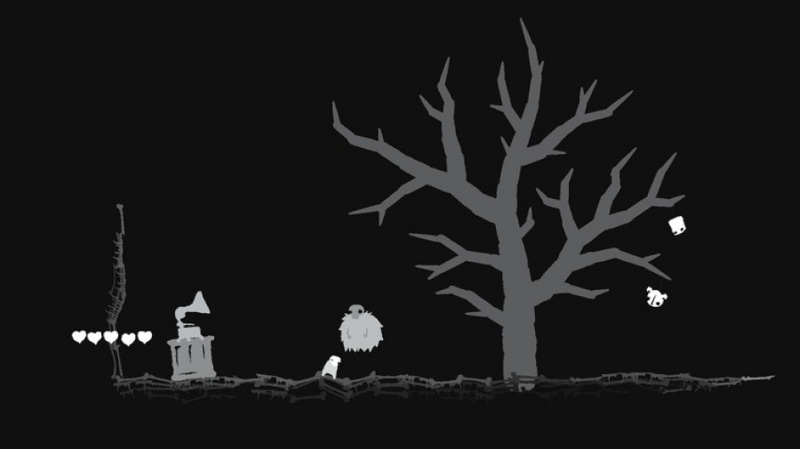 @davidevoid Aside of the music being fundamentally awesome, that further explains its win at IGF in the audio category! Well you just sold the game to me. I was wondering what the game actually was like as it's still not 100% clear for me. 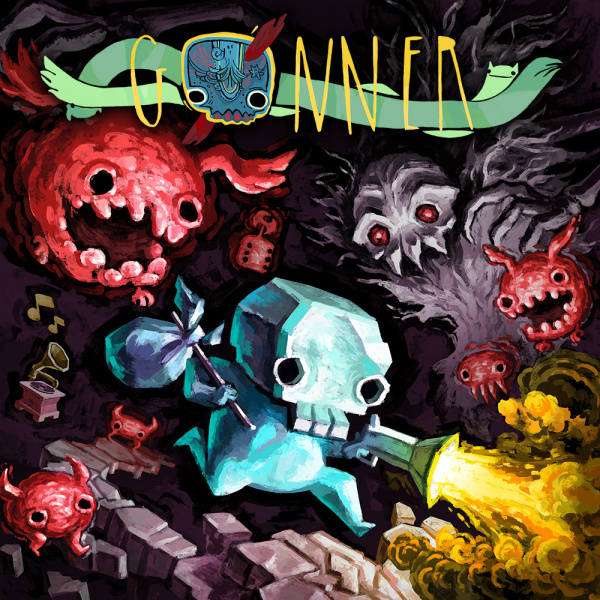 Linking it up to Nuclear Throne which was one of the biggest surprises of the year for me along with Enter the Gungeon last year means that I'll have to check out Gonner now. Really hope Nuclear Throne gets a Switch release one day as well. Love it on the Vita, but I'm ready to move on tbh. I've had the game crash a few times already. Not looking good in that respect. @xxAcesHighxx I love seeing people get really positive about a game. I will be grabbing it this weekend. Not a fan of random generated anything. Some I can tolerate, others not so much. The End Is Nigh though, that new Switch exclusive coming from Nicalis (with physical release and full color manual to match Binding of Isaac and Cave Story+ and the upcoming Blade Strangers)... that I like. Was interested until it said rogue like. All AAA games wanna be open worlds and all indies wanna be rogue like. Sssssick to death of random generated lazy developers. @Alucard83 simple graphics don't make them bad. I think this game is very appealing visually. Looks like Runbow in a way. Might pick this up, maybe if it goes on sale. Your review sold me on the steam version. 2.99 on sale now. If I like it enough and theres a subsequent switch price decrease I will consider double dipping for portability. But being a 2d platformer, I think the lack of dpad hurts the portability on switch. @Filth_Element Nah. Lazy? Just nah. "Procedurally generated" is used as a general term and encompasses a wide range of random elements. It may mean each segment or level itself is handcrafted and the sequence is randomized. Or instead the layouts are set, but certain elements are random, such as enemy placement. It doesn't mean someone just hits a button and a game is made and shipped for them. This stuff requires a lot of work, usually even if the results are subpar. Regardless, GoNNER is pretty exceptional, addictive and endlessly replayable, so is there a point in calling out this developer for bringing an acclaimed project over to the Switch? Point is, judging a developer and their work as lazy based upon a rigid reaction to a broadly used phrase is plain irresponsible silliness. No sorry just over these seems like every Indy at the moment is closely followed by rogue like or randomly generated. Tired of these forget the lazy tag maybe these developers are un-creative. Is that better good sir? Or is there something small within this text you'd like to pick out? @meppi Nice one! Seriously, it's such a good game. You won't regret it. Enter the Gungeon is coming to Switch later this year and it'd be awesome if Nuclear Throne could join it. If you get the chance, send a Tweet to Rami Ismail. He's one of the devs and a great guy. He told me that he'd like be to bring NT over, but needs to know the demand is there. I think it is! Spelunky and Risk of Rain would also rock on Switch! @GrailUK Hey, I'm glad. You'll love GoNNER. I own it on Steam as well, but Switch is definitely it's rightful home. Supporting these awesome devs will only make publisher, Raw Fury all the more likely to bring other games across, too! @Alucard83 GoNNER is all about the gameplay, my friend. Graphics aren't important in comparison. Though it must be said that you have to play this game to appreciate its aesthetic. The art is actually really well done! Luckily there is Nintendo, otherwise this platform would have been a great failure considering third party support like this. @Mishima ...because many, many gamers adore the genre! That's why. Cool? What is it with some people? Feeling the need to knock a game because it falls under a certain genre or because it looks a certain way. Man, here's an idea; keep your negativity to yourself and let the rest of us enjoy the game for what it is... utterly brilliant! It would be good if videos or trailers were linked from review articles. This is an INDIE game! Besides, the more variety any system has, the better it is for everyone, right? That way there's something for everyone. I've bought and loved Breath of the Wild and Mario Kart, and hopefully I'll pick ARMS up soon, too... but there's more than enough room for cool indies as well, no? Seriously, what is it with people and their unnecessary, negative comments? If you don't like a certain game, that's cool, just sit back and let others enjoy it. I find this kind of attitude so frustrating! @xxAcesHighxx Nice! I just sent him a tweet. Ended up playing Gonner till 1am last night, so that's a very good sign. So far it's not grabbing me as hard as Nuclear Throne did, but then again I'm a sucker for overhead shooters, not to mention vertical scrolling ones. Only was able to get to stage 2 so far, so it's still early days. Can't wait to get back home from work tonight and play some more. So glad Enter the Gungeon is making it over. I'm hoping we see a physical release as well as I'd buy it in a heartbeat along with a digital release for convenience. Really liked what I played of Risk of Rain. Just got the LRG Vita release last week as well in fact. Need to put more time into it though. @xxAcesHighxx What is an indie if not a third party game? Variety is good but there is something about 'perception'. And currently the Nintendo Switch is being perceived as a poopie indie supported console because these smartphone quality games gets the news instead of an even boring AA. I don't like procedural generated, but the graphics-style is so unique that I might try it someday. @Tetsuro I try not to offend and make an effort to be constructive but you're talking poo about something you clearly haven't played. Not once have I heard anyone refer to Switch as a "poopie indie supported console", what is a poo pie anyway!? In fact the number of people I know who haven't touched Nintendo for years either have or intend to purchase a switch. And of those who have, a number of them have praised the variety. To all but the close minded, indie games can be amazing too regardless of the net spend on development and shininess of graphics. @SmithJurd I have purchased it, and I'm fine with it. With Zelda, Arms and Splatoon, that's it. Variety of what. Same games are present on other consoles. Here they take the news because there are few games. Indie games are fine. Shovel Knight is fine, this isn't anything that would satiate appetites, it's an hopefully decent game (probably mediocre) that will be overrated like any indie game. And graphics wise is real poop. @Joeynator3000 Isn't it a child term? @Tetsuro GoNNER is no smartphone quality game! What an insult. Have you even played the game for yourself? And Switch is a, ahem, 'poopie indie supported console?' Riiiiiiiight! @SmithJurd @Joeynator3000, you gents are clearly gamers of substance that can and do appreciate the rich variety of content that Switch provides. I respect you fellas for that. @xxAcesHighxx Well guy, I have played any type of game in the last thirty years. Especially brilliant games 'made in a garage' thanks to my old Amiga, but you see genius in any **** release. But this is going to do more harm to the market than the contrary. This isn't Captain Blood, it's a mediocre game (decent by todays standards) that you are going to 'send in heaven' like you have done to other **** like Isaac, etc. You aren't doing any good to the gaming community. It's not all about graphics, but substance here there is not. Anyway be happy with your mediocrity. U.S.A. today just teach that to their population. I'm happy with the indie scene if there is actual substance and quality, otherwise it's just Atari all over again (be happy with it, I'm not). @SmithJurd Pleasant graphics it's ALWAYS a plus. Then if a game is pure genius and has mediocre graphics it still deserves consideration, if it's just ugly in my opinion not since I'm an aesthete. @Tetsuro Just for clarity... Have you actually played GoNNER? If not, what are you basing the claims of mediocrity on because all I've heard are good things... I too have been gaming for 30+ years and it's not just (or even generally) the games with cutting edge graphics that are the best. @SmithJurd Isn't a 20 minutes gameplay video enough to make an idea out of a game? Should I waste my money on it to say it looks just as a decent game? I have never said it needs cutting edge graphics to be good. I said graphics is always a good thing, and always add value to a game. @Tetsuro Fair enough, our opinions differ but it does seem like you were making some pretty broad generalisations. Personally ive played a number of games over the years where my opinion has changed from seeing gameplay to actually experiencing, for the better and the worse! That's the beauty of being free minded individuals, if you don't like it, don't buy it 😁 As to your final point, graphics do not always add value and I think it's safe to say that is a fact! @SmithJurd Sure, opinions can change by playing, that's true. Why graphics don't add value? If before it's ugly and after it's beautiful I would be more tempted to buy it, because of 'value'. Anyway there are people that actually like uglyness, so maybe they value that but it's just a point of view. Generally beauty is more appreciated than uglyness. @Tetsuro Listen sonny-jim, I'm 44 and born and bred in East London. Don't try and school me. I'm really not sure what your USA Today crap is about? I know you're not too far off my vintage (age) yourself, but I was gaming before 1980. But yeah, well done with your Amiga. Anyway, GoNNER is far from average (as it's review scores prove), and it certainly isn't of smartphone inferior quality. Many, many people enjoy good quality indie games, and that, my friend, is very good for the gaming industry. @SmithJurd Sure, in fact I talked about added value. @xxAcesHighxx Every mediocre game nowadays can get excellent votes, that does not prove anything. Videogames critics aren't reliable. It's not me to teach you, it's this game that offer you a weird taste that you confuse with genius. And every indie nowadays follow the same route to cheat people. "Hey look how wierd, and you can shoot and jump." And the graphics is hand made with just last finger of my hand"
"Wow and cool" is the english mantra. I hope John William Waterhouse wasn't reacting in the same way back in time at things (decline?). @Tetsuro It is not for you to dictate what people find cool nrt deride people for their reaction to a game. And it most certainly has nothing to do with being English, I'm not even sure what you mean by that. @SmithJurd "Cool!" it's a cheap subculture now popular that started from native english people, everything it's cool and you saw this from any video provided by english people. Now this infected almost every community around the world by mining young people that's easily influenced. In any country you now can find people saying cool or wow any x seconds. For any ****. @SmithJurd In Italy we say 'fico'. But it's something we took over from americans some decades ago. Now we are infected with a 'fico' in short intervals, because bad things generally tend to degenerate overtime. Europeans can't be saved because culture is driven by money, and money (monetized culture) comes from US. While I don't appreciate current english culture I'm not happy they get isolated or get annexed by americans (that eventually are even worse, completely subject of corporations), eventually we will be in time to hugs the scots, when they will leave the United Kingdom. @Tetsuro It's twenty-to-eleven right now and I'm absolutely exhausted (if that doesn't show my age!) but here's my last word on the topic..
For the record, I've never said that GoNNER is 'genius'. What I have said is that it's well above average and it's extremely addictive. That's what the game is to me, and surely that is what counts, right?! Sure, for every great indie, there are a crap load of bad ones. But one thing is clear; indies are here to stay. And I for one, have no problem with that whatsoever. Didn't care for this, but the more i watch videos of it, the more i feel like i want to play it myself.